One week ago, while we were at Disney World, I received the news that we lost a true legend of Georgia Bulldogs football — legendary radio announcer Larry Munson. He was 89, and he passed away from complications from pneumonia. Munson came to UGA in 1967. He was already in his forties and in the midst of an accomplished career in broadcasting. It took him a few years to get the hang of loving the Dawgs, but once he did he became a true “homer,” rooting on the team he was calling the game for. Hunker down, you guys! If you didn’t hear me, you guys, hunker down!…I know I’m asking a lot, you guys, but hunker it down one more time! We hand it off to Herschel, there’s a hole….5….10…12, he’s running over people! Oh, you Herschel Walker! Look at the sugar falling out of the sky! So we’ll try to kick one a hundred thousand miles. We’re holding it on our own 49-and-a-half … gonna try to kick it sixty yards plus a foot-and-a-half … and Butler kicked a long one … a long one … I can’t believe what he did! This is ungodly! We just stepped on their face with a hobnailed boot and broke their nose! We just crushed their face! Buck back. Third down on the 8. In trouble. Got a block behind him. Going to throw on the run. Complete to the 25, to the 30. Lindsay Scott 35, 40. Lindsay Scott 45, 50, 45, 40. Run Lindsay! Twenty-five, 20, 15, 10, 5. Lindsay Scott! Lindsay Scott! Lindsay Scott! … Well, I can’t believe it. 92 yards and Lindsay really got in a footrace, I broke my chair, I came right through a chair, a metal STEEL chair with about a five inch cushion … Do you know what is gonna happen here tonight? And up at St. Simons and Jekyll Island and all those places where all those Dawg people have got those condominiums for four days? MAN, is there gonna be some property destroyed tonight! 26 to 21, Dawgs on top! We were gone. I gave up, you did too. We were out of it and gone. Miracle! Larry Munson retired in 2008 at the age of 86. There is no one anywhere close to Munson in the pantheon of college football radio announcers. As much as I love Scott Howard, Georgia’s current announcer and one heck of a “homer” himself, he’ll never reach the level of excellence that Munson did. I had the privilege of meeting Larry Munson on a few occasions. When I was working for BellSouth Mobility in their Athens office, they brought him out for a couple of autograph sessions at the retail store in front of our office. When there wasn’t anyone in the store, they’d let us come out and talk to him. He was completely unpretentious, and he shared stories from his illustrious career. In 2000, again when I was working for BellSouth in Athens, I was given a pair of tickets to the football banquet that December, and I took my brother. It was an awkward time, as Coach Jim Donnan had been fired that week. Munson was at the banquet, and he’d had a bit too much to drink. He went around to every table, slapping every man there on the back and acting like he was best friend with everybody. Larry Munson was a true character. Since Munson’s been old as long as I can remember, I often wondered how I’d react at his passing. Last Saturday in the Magic Kingdom, while the rest of my family was watching the Main Street Electrical Parade, I was looking at the tributes to him on Twitter, overcome with emotion. I’m sure I’m not the only one. Larry Munson was a one-of-a-kind man, and the Bulldog Nation misses him deeply. It’s so easy to get cynical about professional sports. Every day it seems like there’s some sort of scandal sending shockwaves through the sports world. But once in a while a story comes along that proves that there are some true class acts in professional sports. On March 6, University of Georgia baseball player Johnathan Taylor was paralyzed following an onfield collision with teammate Zach Cone. Taylor is still confined to a wheelchair and has undergone extensive grueling rehab. The team and fans have rallied around him, praying for him and wishing him well. This week, in the 33rd round of the Major League Baseball draft, the Texas Rangers drafted Taylor along with Cone, who was drafted 37th overall. The selection of Taylor was one of the feel-good stories of the three-day draft. In the first round, the Rangers used the No. 37 overall pick to take Georgia’s Zach Cone, who was involved in the devastating outfield collision with Taylor in a March 6 game against Florida State. Cone and Taylor remain best of friends and celebrated Wednesday’s announcement over the phone. Taylor was undergoing rehabilitation at Shepherd Spinal Center in Atlanta that has continued since surgery for a broken neck. He is paralyzed from the waist down. “JT was so pumped up and couldn’t have been happier,” Cone said. “He was very surprised and not expecting it to happen. I was very happy for JT because I knew being drafted was something he always wanted. “Classy” is the right word. I’m impressed with the Rangers organization. Between Josh Hamilton’s second chance and drafting JT, I’ve made the Texas Rangers my second favorite baseball team…and my favorite American League team. Here’s to the truly classy guys in professional sports. Last week I wrote about the struggles the Georgia Bulldogs have had this football season. Coming into last Saturday’s game against Tennessee, I hoped and prayed that something would energize and fire up the team. Something did. 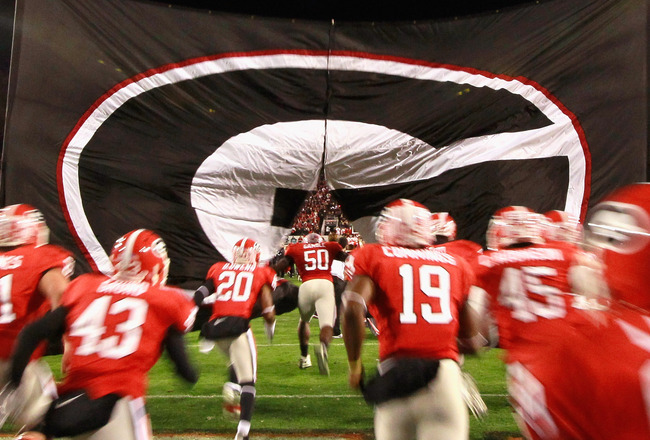 The Dawgs showed up, showed out, and trounced the Volunteers 41-14. The Georgia Bulldogs are 1-4 as of this week. As a lifelong Dawgs fan, I not used to a record like that. Along with the rest of the Bulldog Nation, I’m trying to figure out what has gone wrong. We have so much talent between the players and the coaching staff, and as a program we have a history of success. So why are we 1-4 (and 0-3 in the SEC)? Who’s Ready For Some College Football? Why should the grass on the campus of a southern college grow rank to weed, unmolested by the obtruding foot of some sturdy athletes? Why should the invigorating, health-giving, breezy sports of [autumn] flush the cheek of the northern student with rosy bloom, while the southern youth at college languishes in indolence and bad health, unfit for study, lazy, and almost tired of life? So…who’s ready for some college football? I know I am, especially for my beloved Georgia Bulldogs! I got to do something amazing today…I took a tour of Sanford Stadium, thanks to my friends Randy and Jeff. It was fascinating enough to see the stadium empty and to see the grass untouched (no lines, no logos…nothing). I walked through the same tunnel that the players run through and travelled through the “backstage” part of the stadium to view the Press Box, Media Center, and Sky Suites. Randy even held an impromptu press conference in the same room where Coach Richt and the players have theirs. The only thing I didn’t get to see was the locker room. To view the pictures, click here. It was literally the tour of a lifetime for a Georgia Bulldogs fan like me. Thanks again, Randy & Jeff, for allowing me to have the opportunity.